Graphic design, interface design, user experience for web sites and softwares for mobile devices. Logos and brand identities designed for various clients over the last years, 2010-2016. Typography, layouts and compositions in the form of newspapers, magazines and books. "The Anarchist Doctrine Accessible to All", Word+Moist Press written in 1925 by José Oiticica, 2014. What is illustration but the spice of life? Cédric Virassamy (Cédric Bouvard) is a french art director/illustrator born in 1980. He graduated from the École des Beaux-Arts in Bordeaux. He combines hand drawing with contemporary production techniques. 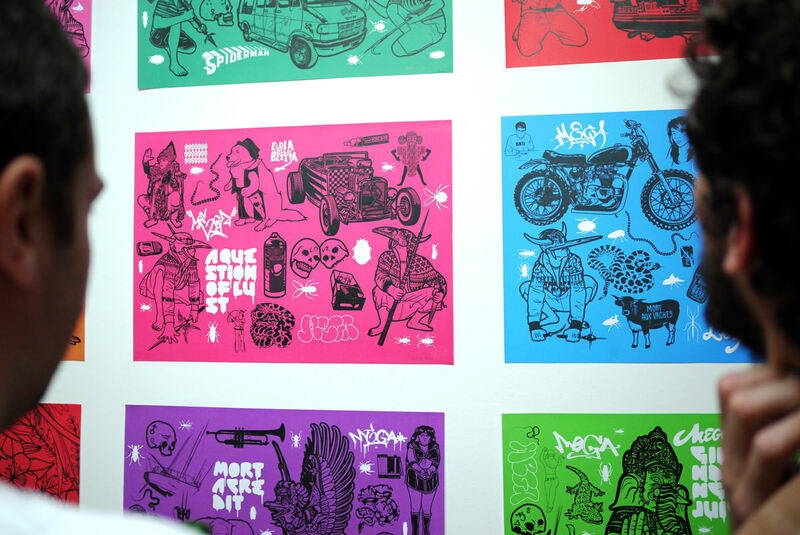 His incisive style can take a number of forms from editorial illustrations, visual identities, posters and clothing. Brice Delarue, is a french graphic designer/art director born in 1981. He graduated from the École des Beaux Arts in Bordeaux. Co-founder of Zirkumflex, he started as a freelace in Milan in 2004 working with magazines and cultural institutions. 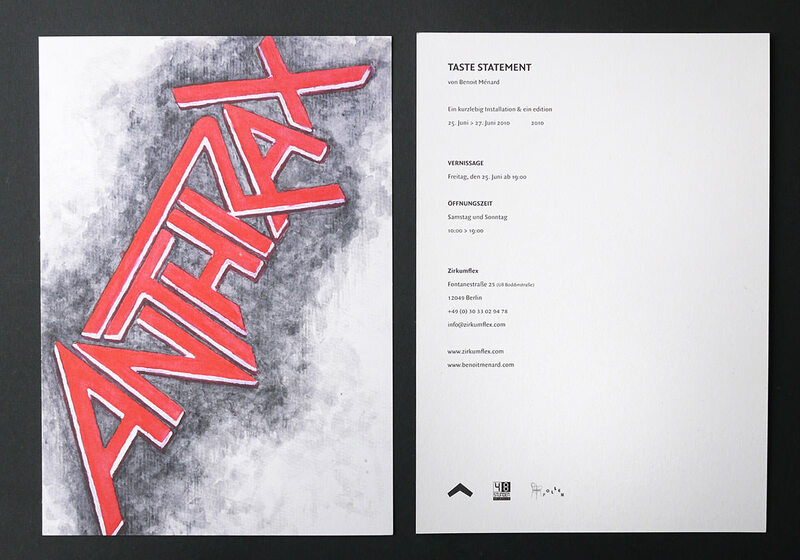 He applies a rigorous and functional use of typography to digital and printed work. Unique copie signed by the artist. Delivered with a certificate of authenticity after the end of the exhibition without frame. Poster / Digital print 70 × 100 cm, paper matt 130 gr/m2. Illustration by Grems. Unique copy! Signed by the artist with a certificate of authenticity. Maria Thereza Alves made Why here? . She worked about art and ecology, presenting local and environmental stories involving botanists, archives and communities. She concentrated on the Central Market of the city and its regular visitors. Street vendors, traders, university, researchers, immigrants, political refugees, native citizens, have all participated to the realization of two video interviews, answering to these two questions: “Why are you here?” and “Which is your favorite plant?”. Jimmie Durham worked on his installation Practically Pinnacle . The title makes reference to architecture, in particular to one element, the “pinnacle”, which contributes to the stability of a building. At the same time, it creates the possibility of transforming into décor. A work that can “remind people of Luis Buñuel or a more elevated form of Marcel Duchamp” suggested by Durham. Flipboard, autobiz, Peugeot, Renault, Citroën, Arte, Rue de Plaisance, Kunstverein Milano, Editions Terre en Vue, Word+Moisture Press, Institut Français Deutshland, Skunkfunk, Word Magazine. Grems, Julia Krahn, Juan Pablo Macìas, GUsto, Club Milano Magazine, Eyebook, Wu Magazine. “Juan Pablo Macías”:http://juanpablomacias.tumblr.com (Mexico, 1974) explores the relation between systems of representation and affectivity, and analogically, between power knowledge and insurrectional knowledge. With his actions, interventions, work on archives and editorial projects, he intends to cause tensions between institution, art practice and social field, by producing programs that operate directly on the biological, social and economic bodies. His work has been shown in major art museums in Mexico and around the world. What are seeds if not ideas? Seeds and ideas are human’s substance, human’s lifeblood… Sap! It’s always Deleuze’s Hyle, this continuum amorphous that bounds everything together in cosmos, that through desire produces life as creation, as knowledge, but as tyranny as well. What are seeds if not the desiring dialogue of humans and nature? What do seeds carry within them if not human knowledge? What are ideas if not the praxis of human happiness in Earth? Why unbound this relation to Earth through exclusivity? ( The human problem consists in obtaining from earth the greatest amount of general happiness José Oiticica). What are ideas if not the process of production of the cosmos, of the univocal process of production of man and nature as one, as desire? Occident’s history of progress is the denial of this bound through abstract deaths they call truths. But nonetheless, there are words of truth, humble ones that vanish in the accomplishment of their affection. To speak with true word lasts the moment of its enunciation, of its performance – it is not its desire to last an eternity as the State’s rotten dead letters, as the petrification of the death sentences of the colonizers of labor – life congealed and concealed. These truths last the duration of their spoken moist, of their germination, of their warm vibrato, that hopefully will carry on, mouth-to-mouth, soil-to-soil, as warm lifeblood. There is no possible affectivity – of experiencing moist and warmth – in reading constitutions, contracts, laws, testaments and school texts, as the warmth we experience reading about life. Notwithstanding the printed matter that carries these words of truth, codifying them, they raise our temperature. Notwithstanding the machine that cuts ink’s continuum, printing it into word-images subject to law, we become happy and willing to pay any price – because this warm flux is life. 432 photographs published without permission and plastered inside the walls of tranzitdisplay, Prague. Backstage of the installation "BotoxCloud" by Andrew Seskunas & SAQ 28 January – 26 February 2011. The aim of this series of events is to discuss important issues relevant to the future growth and to provide German-French and European responses. A selection of Printed Matter. Bookmark 1, a selection of Printed Matter is the first chapter of series of exhibitions and events about publishing intended to exist as a pop-up bookshop which provides the public the opportunity of discovering selected prints from artists and independent publishers works. July 29 – August 5. 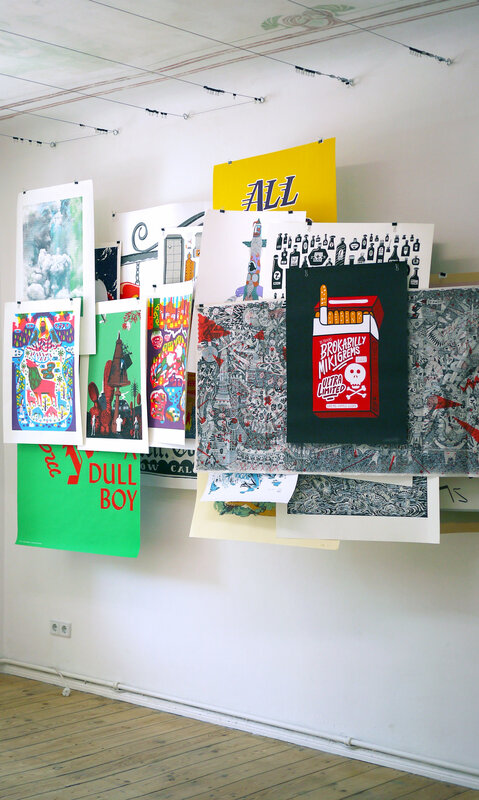 Bookmark 2 hosted – as second temporary exhibition – WALL OF TOMORROW, from July 29 to August 5, six offset posters realised & presented by Diego Fellay at the Swiss Pavillon of Le Corbusier. Swiss graphic designer Diego Fellay, in residence at the swiss Foundation, welcomes illustrators and photographs to recreate this forgotten mural with him. 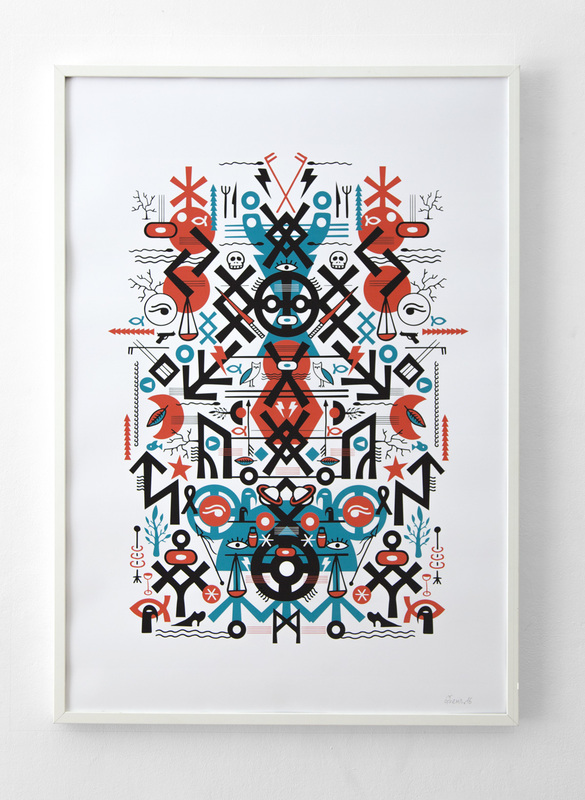 Six original posters will be produced and distributed, as well as 400 copies of each.